The Mohican viburnum is known for its compact growth habit that features multiple stems from its base. The textured dark green deciduous leaves with a fuzzy texture and creamy white flower clusters create a showy shrub that looks good in almost every garden. The underside of the leaves is gray. The flowers are followed by orange-red berries that ripen to black. These berries are very popular with birds. Fall color is a colorful reddish purple that lasts well into winter. This plant is also known as the Mohican Wayfaring Tree and was introduced by the United States National Arboretum. In warmer climates, this viburnum can be evergreen. It is a durable plant that can tough it out in many different circumstances. The Mohican viburnum is great in a mixed border or as a screening or hedge plant. It looks nice with rhododendrons, plantain lilies and ninebark. Choose plants with either smaller or coarser foliage to add contrast to the average foliage of this shrub. This plant works well in a woodland or wildlife garden. The flowers attract butterflies, while the fruit attracts many birds. Mohican viburnum also makes a nice specimen plant with its profusion of flowers in the spring. Since the growth goes right down to the ground, you don't need to worry about masking the bottom with other plants. It is also suitable for planting beneath power lines if that is a concern. It has a life span of 40 or more years. Plant your Mohican viburnum in full or partial sun. Water it regularly to establish good roots. Prune annually in the summer after flowering to maintain size or shape. 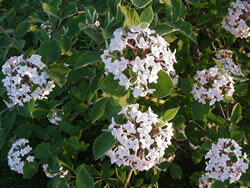 Feed your viburnum with an all purpose fertilizer in spring before the new growth appears. While this shrub appreciates moist well-drained soil, it is adaptable and will grow almost anywhere. It is relatively pest free and easy to care for. It is deer resistant as they tend to leave it be in search of better treats. There are no real negative characteristics for this plant.